I live in Cirencester in the Cotswolds (UK) and work from a studio surrounded by fields, just a few miles away from home. I design woven textiles and I hand-weave cloth. My designs can be woven in a range of weights; for rugs, upholstery cloth, soft-furnishing or for accessories such as scarves. These can be unique hand-woven pieces, collections for exhibition or designs for commercial production in quantity. I am a Licentiate Member of the Society of Designer Craftsmen. 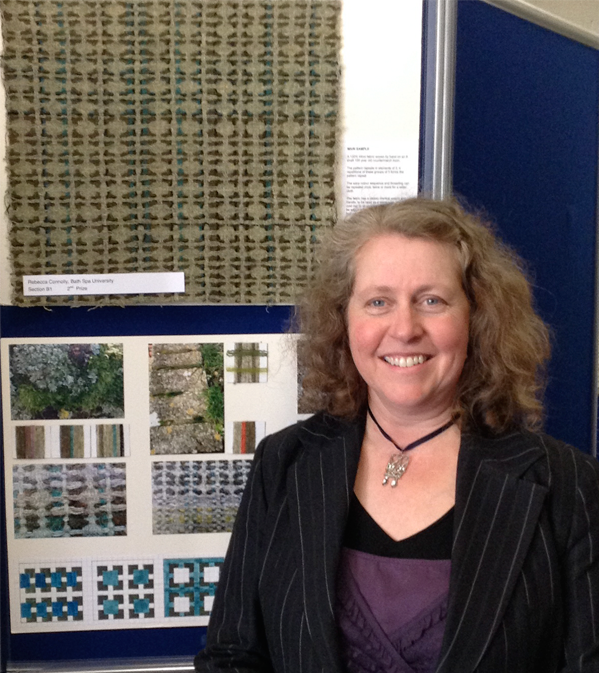 Following a ‘down-shift’ from a career which kept me abroad all too often, I decided to return to education in my 40’s with an A Level in Textiles; this led to University where I graduated from Bath College of Art & Design/Bath Spa University in 2015 with a First Class BA (Hons) in Textile Design for Fashion & Interiors, specialising in weave. My Welsh heritage often inspires my work, in colour, raw material and aesthetic; I often design with the traditional Welsh two layer ‘double-cloth’ weave structure. The technique of ‘Colour and Weave’ which produces larger patterns are another favourite. I am passionate about using wool in my designs, my preference are yarns made from British sheep breeds in black, grey and brown as well as white, supplemented with colour from natural plant dyes over chemical dyes whenever practicable. I relish the challenge of new collaborative projects; in the past opportunities of this nature have resulted in the most exciting outcomes using my skills in cloth weaving. I also teach weaving and natural dyeing to students with diverse levels of experience; from undergraduates to children, in groups or working one to one. I run workshops and demonstrate weaving for many local Art, Craft and Heritage organisations. I am fascinated with traditional textile manufacture, with a ‘soft spot’ for old wooden floor looms (I have several!). I am a member of the Stroudwater Textile Trust whose aim is to preserve the Cotswold’s industrial heritage; the Mills, Weaving and Wool.